You know that feeling, you’re working at your desk and slowly but surely that dull ache in your forehead slowly takes over your ability to concentrate. If you’ve encountered that sensation before then, you may be experiencing a tension headache, the most common kind of headache. For most of us, over-the-counter pain relievers have become the first line of defense in fighting them, but did you know that continually using these medications can cause more headaches through overuse? 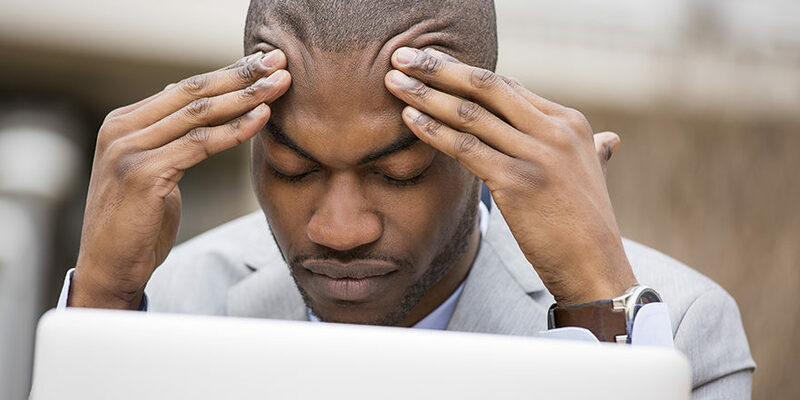 Let’s take a closer look at what tension headaches are, possible causes, typical symptoms, and some exercises that can help ease and prevent symptoms before they even start. Tension headaches are a result of muscle tension in the head, neck, and shoulders. They are primary headaches, meaning they are not caused by another disorder but occur due to a headache itself. They can be episodic (occurring one to fifteen days per month) or chronic (more than fifteen days per month) and can last anywhere from a half hour to three days. These symptoms are usually mild to moderate in intensity and do not get worse with exercise like a migraine headache would. A study found that those who experience both episodic and chronic tension headaches have weaker neck muscles than those who don’t experience such headaches. So, it’s really important to release tension and strengthen the muscles in your neck and shoulders. Stand up and give these exercises a try! Shrug your shoulders up and backward as if you’re trying to pinch a pencil between your shoulder blades. Tilt your head to the right and pull it towards your right shoulder using your right hand. Repeat with the left side. Look up towards the ceiling and turn your head slowly towards the left, back to the middle, and then the right. With your hands behind your back, grab your right wrist. Pull your wrist over to the left side while tilting your head to the left. Repeat, grabbing your left wrist instead and pull it to your right side while tilting your head to the right. There are many options to help manage tension headaches, from strengthening with physiotherapy to relieving tension with massage and acupuncture. Physiotherapy is a great way to help strengthen muscles in your neck and shoulders. Book an assessment today to start feeling better!